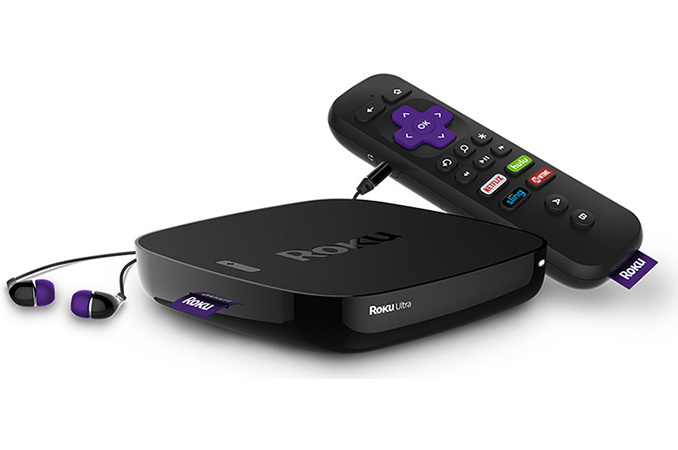 Roku this week introduced a new family of five streaming media players for various needs and customers. The new affordable players support 1080p HD video streaming and some of them are even compatible with older TVs with composite inputs. The more advanced players support streaming of 4Kp60 content (3840x2160 resolution at 60 fps) and the high-end models even supports HDR10 metadata, which will be useful for those who would like to watch 4Kp60 HDR video and have appropriate TVs. The fifth generation Roku streaming media players run the proprietary Roku OS and support dozens of video streaming services, including those from Amazon, BBC, Google, HBO, Hulu, Netflix, Vudu and so on. The set-top-boxes are self-contained devices that are connected using an HDMI input to TVs and can be operated using bundled remote controls. Depending on video output capabilities and feature set, pricing of the new players ranges from $30 to $130. SoC Unknown Broadcom BCM2836 (quad-core, 900 MHz) Unknown SoC with four cores and UHD video capabilities. Remote IR Wi-Fi Direct IR Wi-Fi Direct with headphone jack. Player includes IR receiver. Wi-Fi Direct with headphone jack, voice search. The most affordable STBs from the new lineup are the Roku Express and Roku Express+ players, which connect to 802.11n Wi-Fi, support up to 1080p video and retail for $30 and $40, respectively. The Roku Express+ version is especially notable here as it's the only new player from the company in the last two years to support RCA composite video for older, pre-HDMI televisions. Meanwhile the Roku Premier series complements the company’s Streaming Stick product released earlier this year, which has similar capabilities, but is more portable and expensive ($50). The considerably more advanced Roku Premiere, Roku Premiere+ and Roku Ultra are based on more powerful SoCs with four CPU cores to enable 4Kp60 video decoding as well as additional functionality. Furthermore, the premium players also feature Wi-Fi 802.11ac MIMO dual-band connectivity. Among the higher-end players, the Roku Premiere+ and the Roku Ultra also support displaying HDR video via the HDR10 standard (but note that Dolby Vision is not supported). In addition, both players are also equipped with microSD card readers for additional channel storage and USB ports for local playback. The baseline 4Kp60 Premiere STB goes for $80, while the HDR-capable Premier+ player costs $100. Meanwhile, the top-of-the-range Roku Ultra is available for $130. For additional $30, owners will get a more advanced remote with a speaker (for the lost remote finder feature), a digital optical audio port as well as improved support for lossless audio formats like ALAC or FLAC (but no Dolby Atmos). The new Roku Express, Roku Premiere, Roku Premiere+ and Roku Ultra STBs will be available in stores on October 9 and can be pre-ordered immediately. The Roku Express+ will be sold exclusively at Walmart. You could potentially use a "smart remote" like a Logitech Harmony series to control your cable box (if you still use it), Roku, TV, BluRay player etc. They can be quite pricey, but do your research, as Amazon reviews show lots of complaints for certain models.